To the outside world Felicity has the perfect life, a job as a children’s author and illustrator, a lovely home in a small village and a doting husband most women would dream of. Underneath all of this though, Felicity is struggling. After the loss of her mother something hasn’t felt right but one day she catches a scent she hasn’t smelt in years…could it be her mother? Following her senses has never been more risky as it all comes down to following her head or her heart. The novel revolves around love, loss and questioning yourself. As Felicity struggles with what she knows is right and what she feels it leads us as a reader to question our own lives. It is also very important to recognise that Felicity is on her own, the mother she adored has gone, she’s never known her father and feels suffocated by the expectations that life in a small village have put on her. After the whole village seems to know that her and husband Quinn have even considered having a baby (something which she hasn’t even decided on yet) her feelings of not belonging come to the surface again. The fact that Cohen has also used multiple POV’s makes this go further than the chick lit title that some have given it (you are WRONG this novel goes further than that!) seeing both Quinn and Felicity’s side opens up a whole new set of questions and feelings towards the characters. I fell in love with both of the characters and it spurred me to read constantly, Cohen has an incredible knack of making you know something isn’t quite right but giving you no clue as to the real answer! After reading Dear Thing, I was hooked by Cohen’s talent and eagerly waited for Where Love Lies, as I suspected Cohen didn’t disappoint. The novel focuses on the fine lines of love that we sometimes forget, the hazy days of a first love and the realities of settling down. While Felicities’ feelings are confusing and at times hard to understand you live through them with her and are just as desperate as she is to work out what is going on. Although I can’t spoil it for you, the ending of this novel is absolutely spectacular and so well researched. To top it all off it’s something that you would never suspect and if anything can be slightly chilling as well as an interesting perspective. 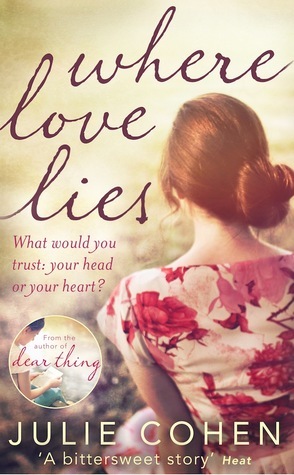 There is a worry of mine that when a novel builds steadily throughout the reveal will disappoint but I can assure you Where Love Lies is completely worth the wait and the suspense. I’m giving this novel 5 stars *****. Although initially I wondered how this would work and worried it could be just a romance Cohen has crafted something inspiring with Where Love Lies, the novel makes you think, question and follows you for a long time after you have finished. I think quirky Felicity and loveable Quinn will live in my memory for a long time, and so will the ending but you’ll find out why once you read it yourself! Why don’t I study music?